IoT solutions can be complex, and we’re always working on ways to simplify them. As we work with customers on real-world, enterprise-grade IoT solutions built on Azure IoT, one pattern we’ve noticed is how businesses route inbound messages to different data processing systems. While the routing logic is straightforward conceptually, it’s actually really complex when you consider all of the details you have to handle when you build a dispatching system: handling transient faults, dealing with lost messages, high reliability, and scaling out the routing logic. You can configure routes on your IoT Hub by specifying the data stream (device telemetry), the condition to match, and the endpoint to which matching messages are written. Message routing conditions use the same query language as device twin queries and device jobs. IoT Hub evaluates the condition on the properties of the messages being sent to IoT Hub and uses the result to determine where to route messages. If messages don’t match any of your routes, the messages are written to the built-in messages/events endpoint just like they are today. We have also enhanced our metrics and operations monitoring logs to make it easy for youto tell when an endpoint is misbehaving or whether a route was incorrectly configured. You can learn about the full set of metrics that IoT Hub provides in our documentation including how each metric is used. Azure IoT is committed to offering our customers high availability message ingestion that is secure and easy to use. Message routing takes telemetry processing to the next step by offering customers a code-free way to dispatch messages based on message properties. 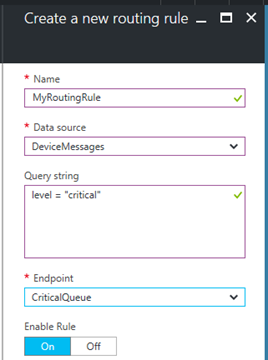 Learn more about today's enhancements to Azure IoT Hub messaging by reading the developer guide. We firmly believe in customer feedback, so please continue to submit your suggestions through the Azure IoT User Voice forum or join the Azure IoT Advisors Yammer group.